Home Encouraging I Can Hear You, ‘ I Don’t Do Morning’s Well’! I Can Hear You, ‘ I Don’t Do Morning’s Well’! How do I know? I can ‘feel’ the resistance from you when you first become conscious and open your eyes. Energy has a lot to tell us, and when there is refusal in the air, some of us can feel it, even from far away. Snuggled under your warm and cozy blankets, it isn’t easy to face the day when it is still dark outside. I get up with my inner alarm clock every morning around about 4:00am. Early rising has come naturally to me since I was a small child, probably for the same reasons that I still enjoy it to this day, I love starting my day at the unusual hour that I do. There is something very unique about the ‘before sunrise’ hours, I can’t really explain in words, perhaps it is the optimistic buoyancy, the uplifting force of the energy that I feel, it holds a essence of deep and strong resilience within it. 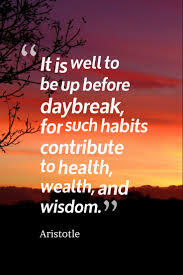 Everything that I have read tells me that early rising is very good for our health. Just like the old saying, ‘early to bed, early to rise’, sometimes the old stuff that people have written is the best advise. Just like anything, new habits can be formed if we make a practice of it. Early to get out of bed people, tend to use their morning quiet time for organization, goal-setting and planning, which leads to greater successes in their lives. Waking up early to exercise boosts our moods and fitness provides energy that allows us to move through our day with greater ease. I’m not knocking all of you night owls out there, you are the unique ones that are linked with creativity and intelligence, but studies have shown that you are more likely to exhibit traits like depression, pessimism and neurosis, which can make you a little overanxious, nervous and tense.